New York City Urban Sketchers met at the new Santiago Calatrava Oculus on Wednesday, and viewed the inside and sketched the outside. 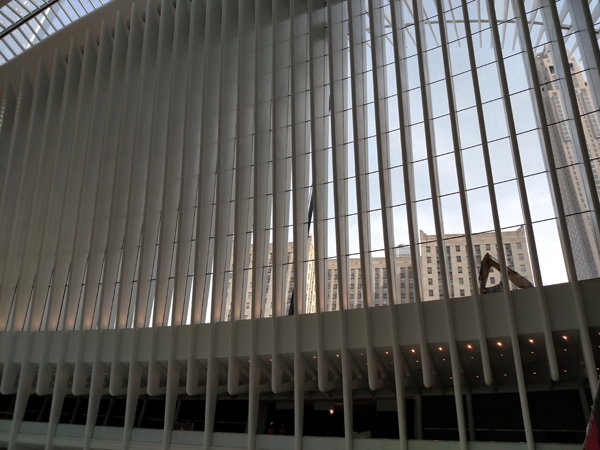 As I walked from the Fulton Center subway stop I took photos of the exterior from the East, the interior, and exterior from the West. 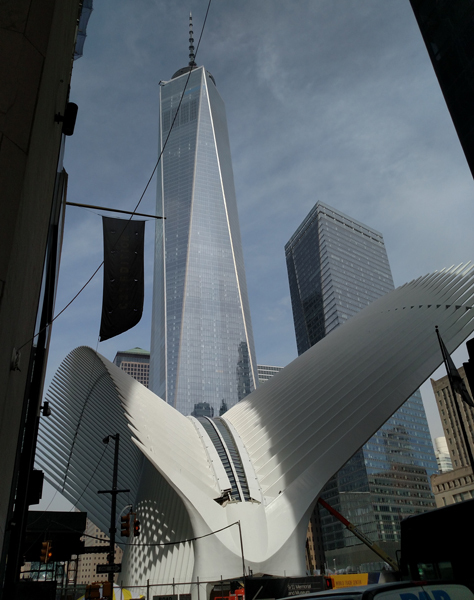 While the group was sketching at the foot of the Freedom Tower, I went across West St. to Brookfield Place and sketched from there. 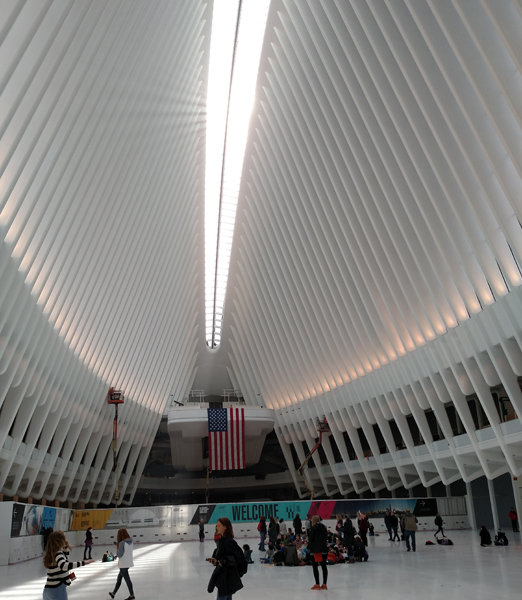 The Oculus is still a construction site inside and out, but it is fun to see this very interesting new center to the Lower Manhattan Transportation Hub. 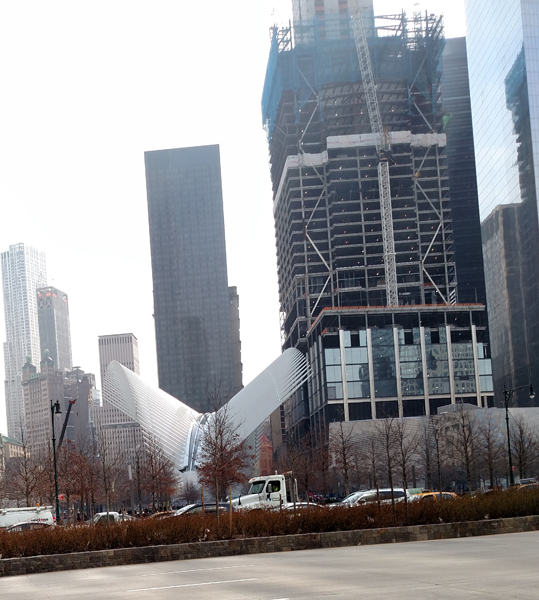 Oculus from the East (Dey and Church St.): That is the World Trade Center Freedom Tower behind it. The Entrance I went in is at the NW corner of Liberty and Church St, just inside the door to WTC4. Follow the signs to the Path Station down 2 escalators, and two long white marble corridors to the Oculus. Interior: The wall covered in posters hides the continuing construction, but it is really the side walls and ceiling that are the main attraction. 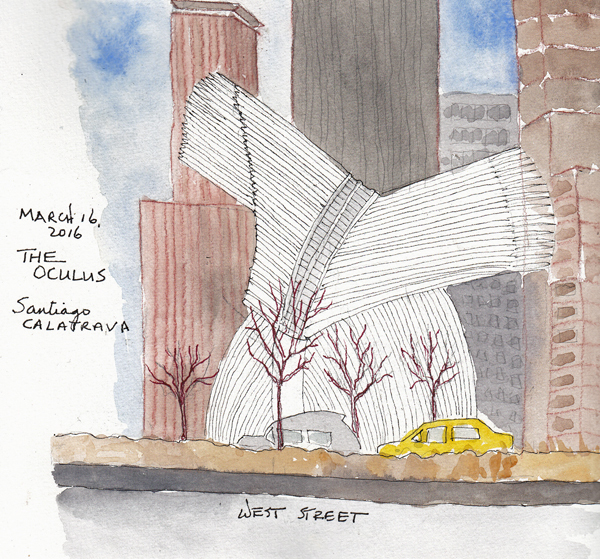 Oculus From the West: I sketched this view (see below), from the front of Brookfield Place and across West Avenue from the Oculus. It will still be a few months before all of the entries are open and the construction tools are gone. 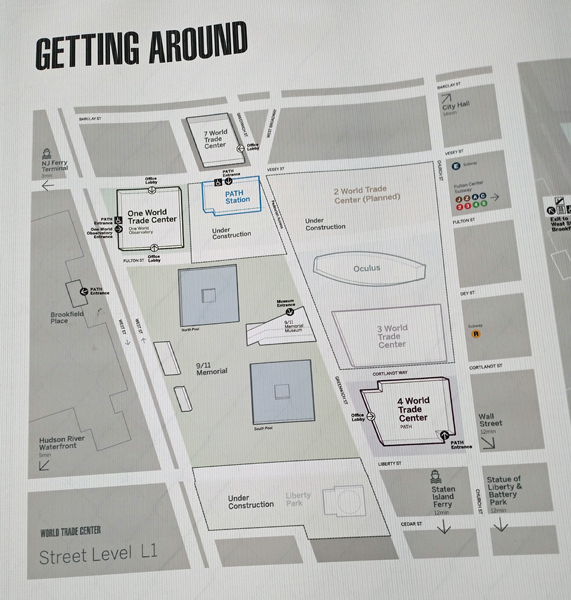 This is a map of the area, including all of the World Trade Center Buildings that will eventually be accessible from the whole Plaza. This is the Map I photographed from within the Concourse linking many of the buildings. My Oculus Painting From the West: I was lucky that the trees were still mostly bare. 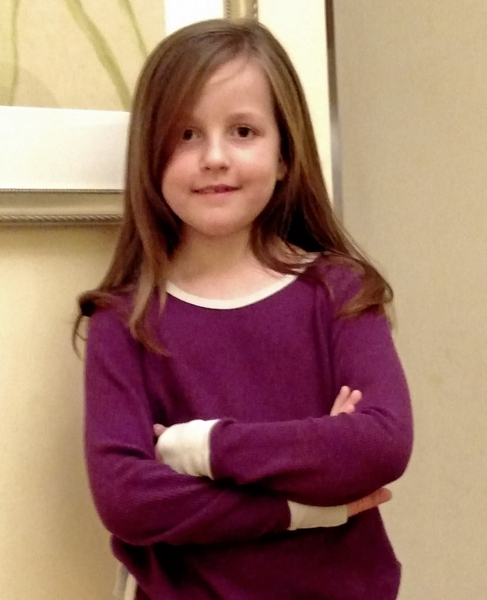 My Husband and I spent a long weekend with our Grandchildren in Washington DC. We don't see them nearly enough, so I like to add their photos in a blog post so I can document our visit. 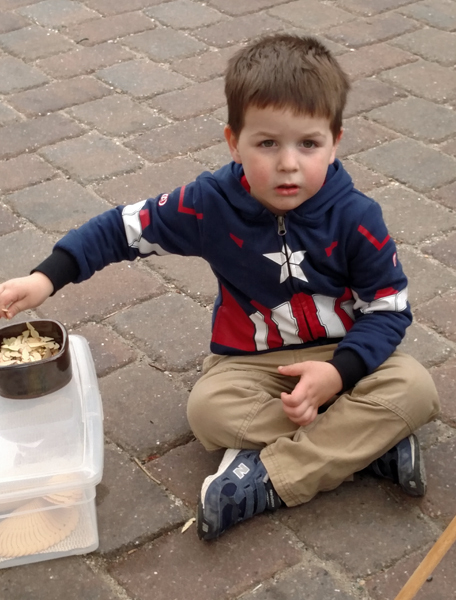 Our Grandson spent time with a wood carver when we were walking through a street market, and loved feeling the discarded wood chips. His big sister is harder for me to capture in a photo. We watched her with a little computer designed to teach kids how to code, but only saw the top of her head. We also spent time painting together during the weekend and these are my sketchbook pages from our projects. I taught her how to make wet-in-wet watercolor backgrounds, and she saved hers to draw on after I left. I sketched two items that were close by for mine. 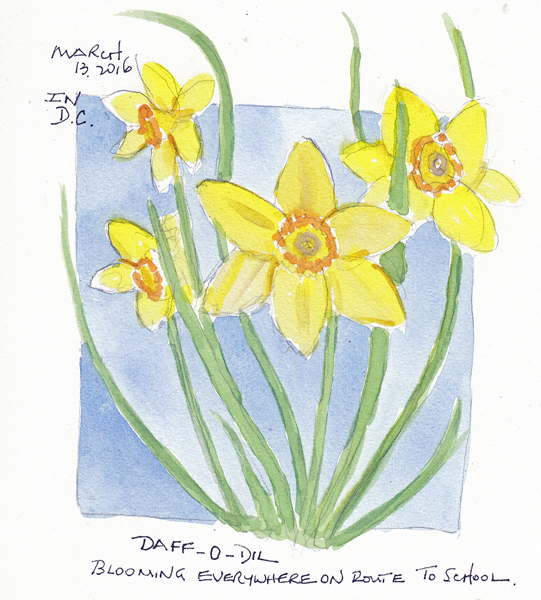 The next day we sketched some of the many daffodils blooming in the neighborhood. Art on Paper Art Show: Some weeks there are major Art Shows all over the City. Last weekend we chose to go to the Art on Paper show because of the number of drawings and watercolor paintings they exhibit. 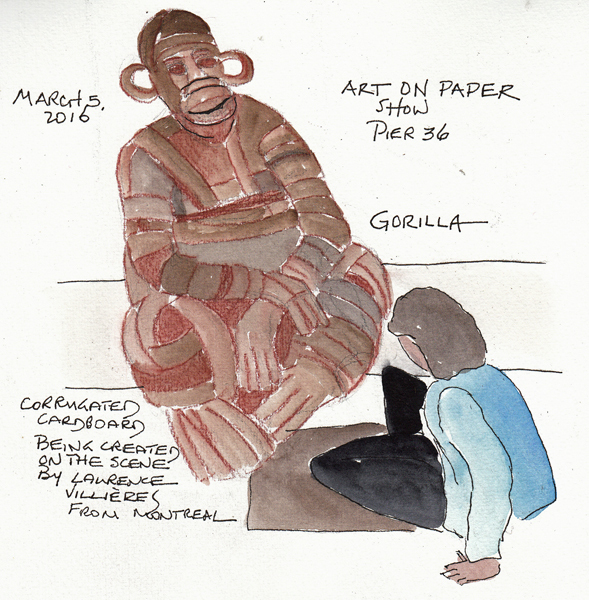 During the show, Laurence Villieres sat on the floor and built this giant gorilla from pieces of cardboard she collects from the streets of Montreal. Impressive! 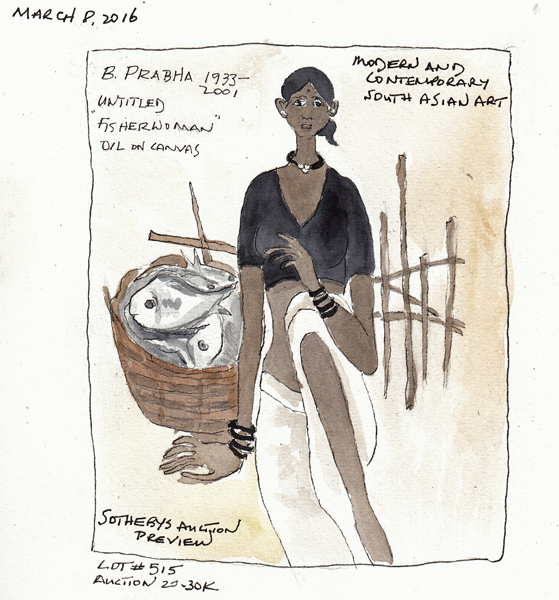 Sotheby's Auction Preview - Modern and Contemporary South Asia Art: My friend Pat and I love this Sotheby's Auction preview which is part of NYC art Asia Week. 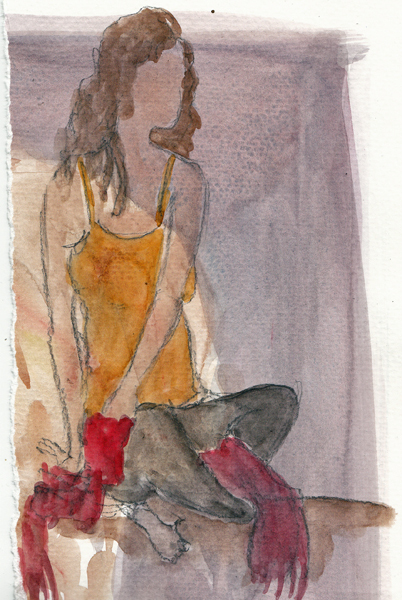 While Pat was copying a Matisse-like painting on her iPad, I sketched two of my favorite figure drawings - adding paint later. After lunch we went to member previews at the new Met Breuer and spent several hours viewing their opening exhibit -Unfinished: Thoughts Left Visible. 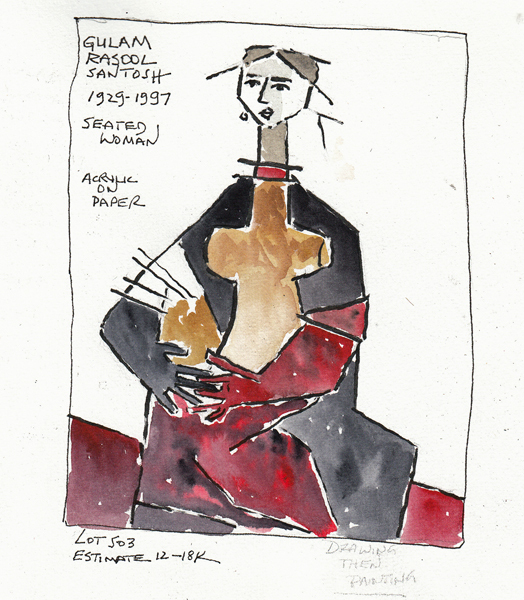 The paintings and drawings selected included work as early as Titian, and as late as Pop Artist Roy Lichtenstein. I especially loved seeing the many paintings that still had their underpaintings and drawings visible, with nearly complete oil painting on the rest of the surface. The amount of information on each identifying card was both a wonderful extra, but also a problem in an exhibit that will be so crowded after the official opening. 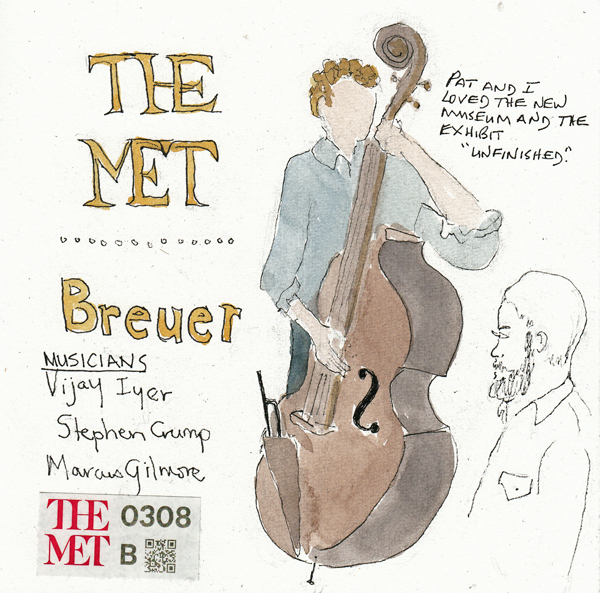 There was live music in the lobby gallery all day and I couldn't resist standing in the crowded space listening to jazz and drawing the bass player right before I left. 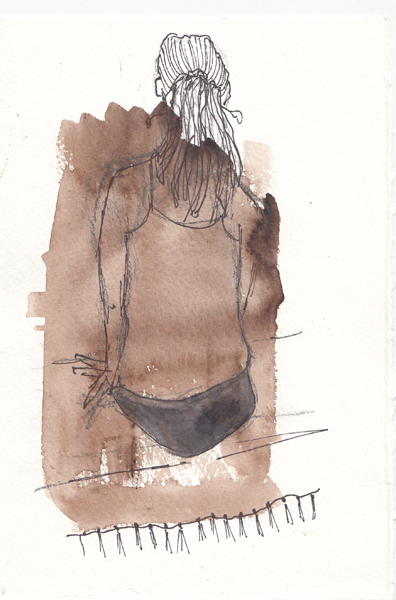 Yesterdaty was our Figure Drawing Day at Battery Park City. 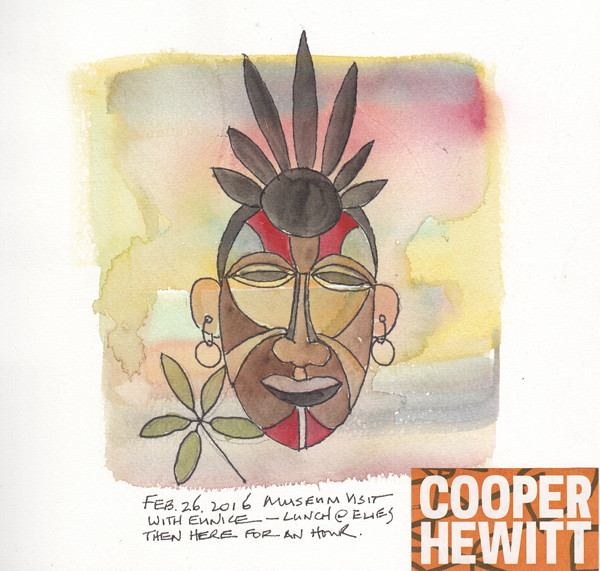 I brought some small pieces of watercolor paper (6 X 10") that had watercolor on them from other projects, and used them for my drawings. My mindset for these Wednesday afternoon sessions is to "play and loosen up." 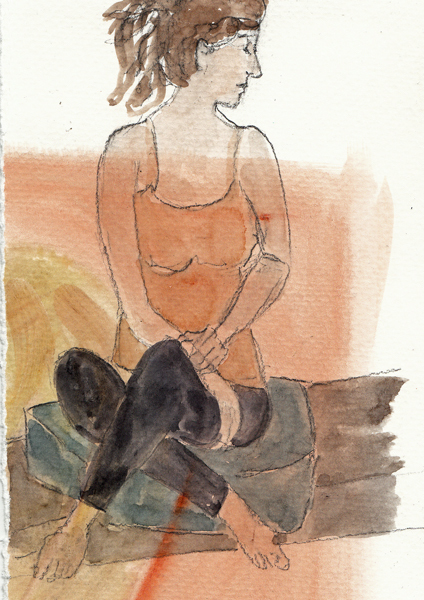 Yesterday I decided to draw the figures in pencil over the paint and then to paint the figures with more watercolor. 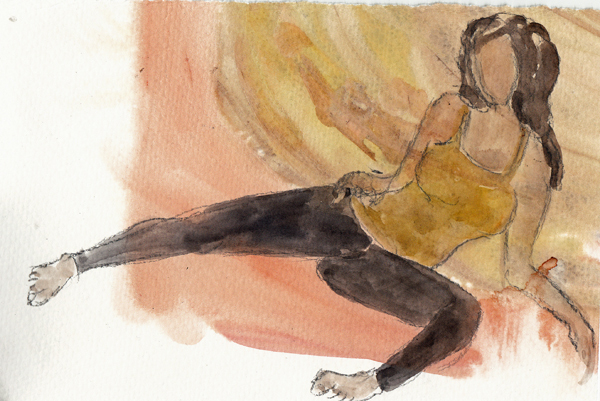 Here are 3 five minute poses and 1 ten minute pose. 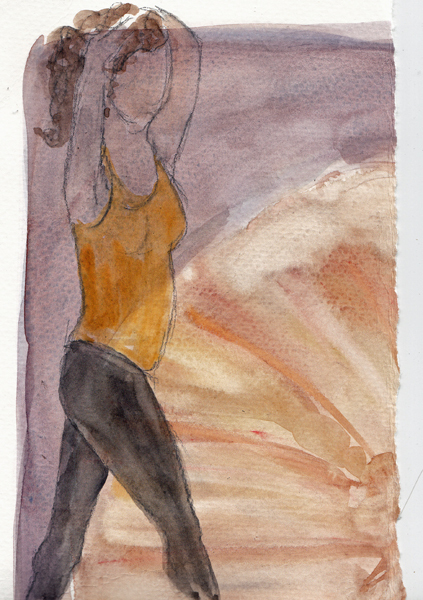 My other 10 minute pose was drawn over a dark brown block of watercolor and I decided to draw in pen and not add any other paint. 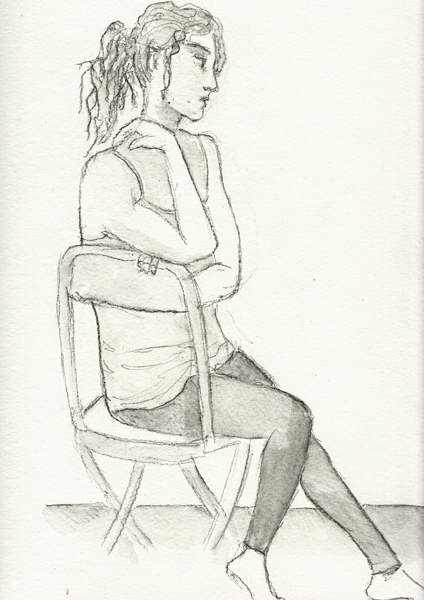 I also used a General Sketch and Wash pencil for our final 20 minute pose - drawing with the pencil and then adding only water to pull the graphite to shade the figure. On Friday my friend Eunice and I went to the Smithsonian Cooper Hewitt Design Museum - my first visit since the major renovation. We loved "Beautiful," the Triennial Design Exhibit. There are many types of articles: jewelry, clothing, furniture, textiles, books, ceramics, wallpaper, drawings, and calligraphy to name some. What makes the visit even more enjoyable are the number of ways you can interact with the designs. When you enter you are given a wand - with a stylus at one end and a scanner at the other. The scanner allows you to upload information and photos of each item in the exhibit to a personal account by touching an icon on the exhibit card. With a unique password on your ticket, you will then be able to open "your virtual tour" when you reach home. The stylus lets you create designs on many flat computer screen tables that are scattered throughout the exhibits. 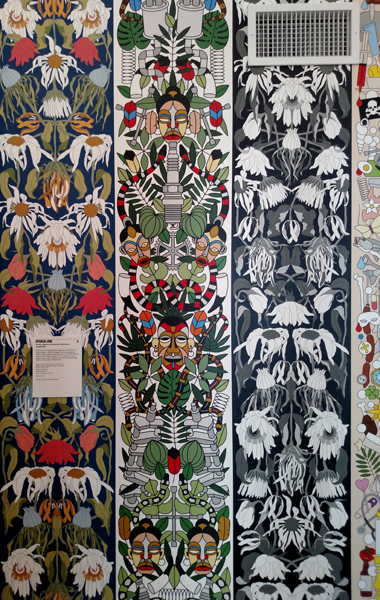 I loved a wallpaper design from the exhibit which was created by "Studio Job" a company founded by Nynke Tynagel (Amsterdam) and Job Smeets (Brussels). Here are 3 of their wallpapers strips - each 29 feet without repeats! This image was drawn from my favorite - the strip in the middle. 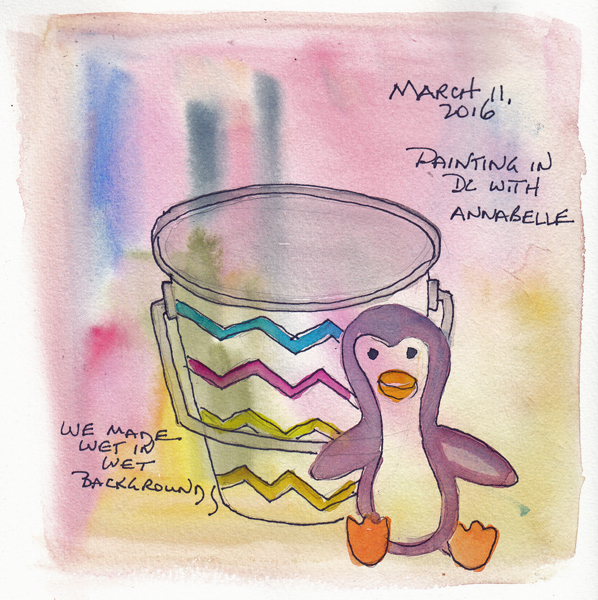 The background was a wet-in-wet watercolor page and the face was drawn on top of it and then painted after it dried. There are several other current exhibits at the museum, and I want to return soon to really carefully look at the Pixar exhibit and the Design Lab.